Welcome to our beautifully appointed, professionally decorated expansive three bedroom, and four bath 12th floor condo, with 4 flat panel TV's. Including a 50 inch flat panel LCD TV and Blue Ray in the family room. With its tropical decor and comfortable furnishing, this is truly a Resort Destination for your comfort and enjoyment! Check out our dramatic discounts and Winter Specials and Snowbird specials . Upon entering this 3 bedroom, 4 bath condo with additional sofa sleeper, you will feel the relaxing but sophisticated atmosphere. The living area is decorated with 2 leather sofas, and a large 50 inch HD flat panel TV and Blue Ray player. It has floor to ceiling windows and breath taking views. A wet-bar, stereo system and ice-maker complement the living area. The patio features a large seating area with a patio table and comfortable chase, overlooking the lazy river and spectacular view of the Gulf of Mexico. The condo's master bedroom has french doors which open to the patio and beautiful views of the Gulf and Bay. The two other bedrooms are outfitted with a queen or king bed and all bedrooms also have a flat panel TV and DVD player. From the time you step out of your car and enter the grand lobby, you will feel you are in a tropical paradise. 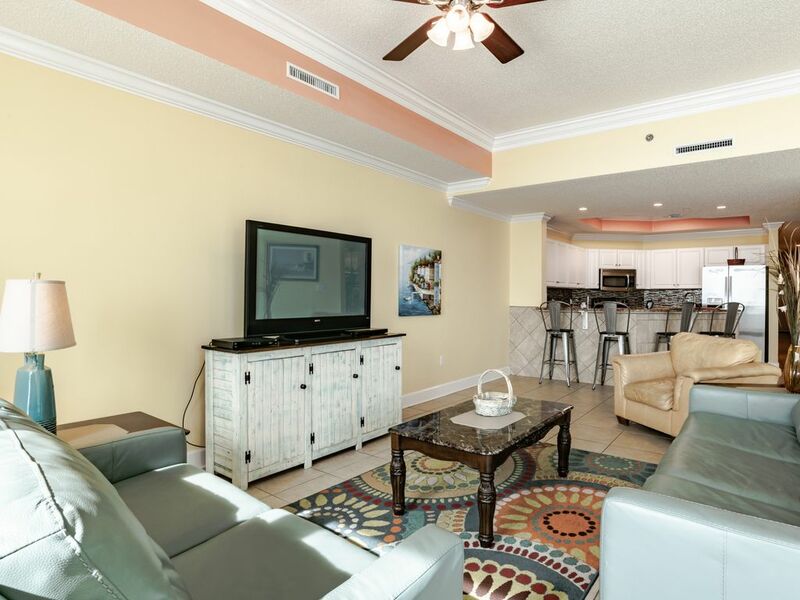 This unit is located in the best location in the building, from the large patio, master bedroom, and family room you will have amazing views of the Gulf. Enjoy a swim in the lazy river, while the kids spend hours enjoying the water-slide. The heated indoor pool is perfect for those cooler days. Near the indoor pool you will find a large state of the art exercise room. The utility room is furnished with a full size washer and dryer. You have covered parking in the garage. The large balconies provide incredible views of the Gulf that span for miles along pristine white beaches and clear blue waters in addition, Phoenix West will be the first gulf front property to offer a lazy river water feature. We spent 7 nights at the condo and had a wonderful time. The condo was great the view was beautiful and I loved the parking so close to the condo. We will rent again. Thanks for a wonderful week with family and friends. Just got back and we had a wonderful stay. This condo is amazing, and the view has to be the best there is! We will definitely be back! We had a wonderful time and cannot wait to stay here again. The condo was very roomy, clean and beautifully decorated. The master bedroom and bathroom were HUGE! Working with the owner was great and check in on-site was a breeze and much better than having to stop elsewhere. The view of the pool area from the unit and balcony was the best to be had. Parking was close to the unit and the elevator was very convenient. Thank you so much. Great condo for our family! We enjoyed our stay in this condo. It was clean. The beds were comfortable. The fridge was new. The furniture and decor were nice. The view is spectacular, and the building staff was friendly. We would stay here again. Beautiful, well-maintained property and pools. Loved every minute! Renting through VRBO was fantastic. Easy, price range we were looking for, perfect location, etc. the condo was amazing and perfect for our family. Enough bathrooms for everyone! Beautifully decorated and perfectly beach-themed. The balcony was amazing...we used that a lot. The property itself was very well maintained. Always clean, very friendly staff. Pools were great...we loved the lazy river and my youngest loved the slide. Close easy access to the white sand beach. We were able to watch some dolphins right from the beach (and a couple times from the balcony!). We went to the beach on a nice sunny day..very fun time. We swam in the ocean, collected lots of seashells, and even got a little sun burned. We’d love to come back. We found the accommodations of unit 1204 to be perfect for our family! There was a ton of space and everything was clean and ready for us upon arrival. The staff at Phoenix West was very helpful and pleasant as well. We would definitely come back! The unit was tired and worn out. It was dirty as we had to have cleaning people come in and swap out the rugs, wash windows, vacuum, dust, etc. Light bulbs had to be changed, the folding doors in the laundry room were broken and the refrigerator didn't have shelves in the door or a working ice maker until three days into our visit. The unit wasn't decorated (no throw pillows, tabletops empty), so it wasn't very homey like other units we visited...very bare. The response from the caretaker, Constance, was excellent. She took care of our issues/concerns whenever we called. However, the owner was very slow to respond. Phoenix West was a great property and would visit again, however, never rent from this owner again. The unit has been updated with fresh new furniture in the living area. New decor has been added. The refrigerator has been replaced. Definately not the nicest I've stayed in. This condo needs many, many updated. There was no shelving in the refrigerator door which limited the amount of holding space which I really needed since I had 5 teenagers with me. The living room tables look like something that came out of a bachelor's apartment, very old and beat up. My 13yr old son even made a comment on how bad and old they looked. Although there was an icemaker machine in the room, the refrigerator icemaker did not work which was a nuisance when getting something as simple as a glass of ice for a drink. Updating the furniture, appliance and decorations would be worth the investment. We've stayed at Phoenix for 4 yrs in a row now and love the building itself but this particular condo itself was not worth the price that we paid. As the owners of several high end condos in the Orange Beach area we strive to keep our units at 5 star level. The refrigerator and ice maker have been replaced. There is now new living area furniture and new decor has been added. Rates are subject to change until reservation is confirmed. Parking $30 per car. No smoking, no pets.